The decision by US President Trump to withdraw from the Paris Climate Agreement could have been disastrous, but the overwhelming response it has triggered may well reinvigorate the drive for climate action. Now everyone needs to get behind the mayors, governors, businesses, philanthropists and civil society groups that have committed to ensure that America plays its part in delivering a climate safe future. Last Thursday, the President of the United States Donald Trump announced his decision to withdraw the US from the Paris Agreement on Climate Change, on the basis that it is “unfair for the US”, making all sorts of wild claims that were immediately ripped down by climate experts and economists. President Trump’s position reflects a gross misunderstanding of the Agreement’s spirit and functionality. In fact, the Paris Agreement succeeded, where others had failed, by establishing a common commitment to limit global warming to “safe” levels, and providing a framework of Nationally Determined Contributions (NDC) to register each country’s mitigation goals for 2020 or beyond. Under the agreement, any plan submitted by the US to the UNFCCC is determined domestically, and serving their own national interest. Withdrawing the US from the Paris Agreement will negatively affect the US economy, its environment, and the health of its citizens, at a time when many are calling for a rapid shift from fossil fuels to renewable energy – and that shift is making more and more economic sense. The solar and wind industries, for example, are each creating jobs at a rate 12 times faster than that of the rest of the US economy. According to the New Climate Economy Commission, transit-oriented urban development could reduce per household expenditure on travel by 20% in the US. But to think that the US withdrawal will halt what has been set in motion in Paris, is wrong. As described by Ban Ki-moon, the former United Nations Secretary General, the Paris Agreement “once unthinkable, is now unstoppable”. This past week national leaders have made clear that the Paris Agreement is not up for renegotiation and reaffirmed their commitment to climate action. Weeks before the G20 Summit in Hamburg in July, the US federal government now appears unprecedentedly marginalised and isolated. 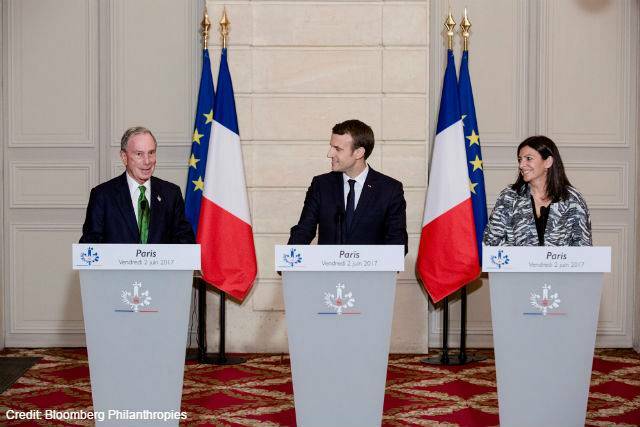 However, the most overwhelming reaction to Trump’s announcement has come from the diverse group of “non-state actors” in the US and globally: cities, states, regions, businesses, investors and philanthropies committed to defend the transformational change that Paris has set in motion. In the US, many are willing to step in and do what the White House will not. Unsurprisingly, mayors are leading this cross-sectorial, bottom-up movement that will have a huge, long-term impact both on global diplomacy and on the US political order. At the time of writing, led by C40 mayors, 279 American “Climate Mayors” have committed in a joint statement to “adopt, honor and uphold Paris Climate Agreement goals”. Michael R. Bloomberg, the former Mayor of New York City and current C40 Board President, generously pledged to give US $15 million to the United Nations Climate Change Secretariat to compensate for the US share of the UN budget. Under his leadership, hundreds of US cities, states, universities, and businesses declared We Are Still In and committed to “pursue ambitious climate goals, working together to take forceful action and to ensure that the US remains a global leader in reducing emissions”. This group is now working on the creation of the America’s pledge, an unprecedented effort to aggregate carbon reductions by cities, regions, businesses and other social actors to ensure that the US achieves its Paris Agreement pledge. In the last days, statements and messages of support poured in from all corners of the world affirming cities’ commitment to delivering the goals of the Paris Agreement. C40 Chair and Mayor of Paris, Anne Hidalgo has resolutely condemned the decision of President Trump and asserted that C40 cities will continue to pioneer and implement bold climate action: “regardless of Donald Trump’s definitive decision, the great cities of the world, in particular the twelve American C40 cities, remain resolutely committed to doing what needs to be done to implement the Paris Agreement.” Dozens of cities from Stockholm and Cape Town, to Melbourne and Mexico, expressed their support through public statements or lit up city halls and landmark monuments in green. More strikingly, cities in the US are taking matters into their own hands, passing legislation and delivering policies compatible with the Paris Agreement. The mayors of Portland and Pittsburgh have announced 100% renewable energy targets for their cities, and the mayors of New York City, Chicago, and Washington D.C have signed Executive Orders to make the goals of the Paris Agreement their own. Many more mayors are set to follow. US mayors are indeed a force to be reckoned with – as one of most urban societies in the world, 91% of US GDP is generated in metro areas. And since 2011, US cities have taken 22% of all climate actions in the C40 network, but only represent 5% of the total C40 population. The outpouring of support for the Paris Agreement once again shows that local governments are leading the way to a cleaner, more resilient and sustainable future for their cities and the world. 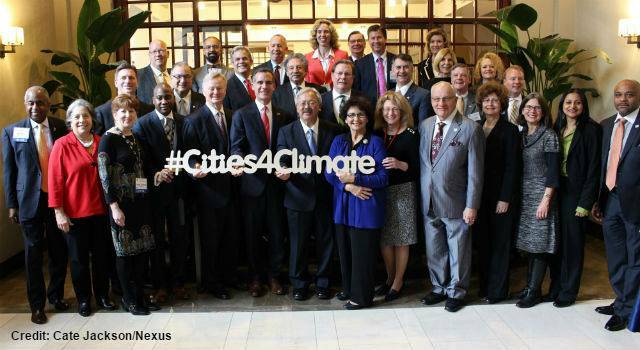 Mayors and city leaders are now the uncontested champions of climate change. Through partnerships with businesses, states, regions and many other committed stakeholders, they can and will deliver on the Paris Agreement. Indeed, they are unstoppable. C40 Cities connects more than 90 of the world’s greatest cities committed to urgent action on climate change. Representing more than 650 million people and one quarter of the global economy C40 brings together mayors to find solutions to cut greenhouse gas emissions and climate risks, while increasing the health, wellbeing and economic opportunities of urban citizens.